If you are looking for a residential care home in Dorset the Castle Farm Retirement home offers a peaceful setting to reside in the countryside. This care home in Lytchett Matravers is set within a farmhouse which was transformed in the 1980’s and has a lovely south facing conservatory for residents to enjoy the outstanding countryside views. The elderly care home in Poole is located on the edge of Lytchett Matravers village with access to all local amenities. 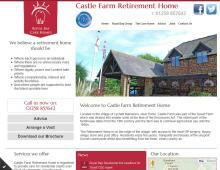 Castle Farm is registered to provide care for the over 65’s, but it is not suitable for the mentally infirm. However it can house high dependency residents at this lovely rest home in Poole & provides respite care in Poole. Please contact Castle Farm to check current availability. Castle Farm retirement home in Poole has had considerable improvement works and has added extras such as a five person shaft lift. This residential care home in Poole has a minibus with wheelchair access and residents are encouraged to enjoy all the events and activities on offer. Royal Bay Care homes in Poole include Castle Farm Retirement Home & Forest Hill House Nursing Home.These are local to the areas of Poole, Wimborne, Broadstone and the beautiful beaches of Sandbanks in Dorset.